You’ll likely remember Edam because it typically comes wrapped in bright red paraffin wax. Yes, that Edam. And because it’s often made with skimmed milk, it has a considerably lower fat content. Win! But don’t count on lower fat content when you use it to make macaroni and cheese. That’s comfort food at its best. For the ultimate cookbook of mac ‘n’ cheese, go get a copy of MELT – The Art of Macaroni and Cheese by Stephanie Stiavetti and Garrett McCord. I don’t want to infringe on their work by including the recipe here, but they have an incredible recipe for käsespätzle that you will love. While I was shopping for some groceries on Saturday, I had to decide between the Gouda cheese and Edam (they do look the same on the outside with that red wax coating). For whatever reason, I chose the Edam! It’s all gone now, and I must say that it was really Gooda! Sorry about this cheesy play on words here. Ha! Good one, Jim. And thanks for the reminder – you’re right, both are sometimes wrapped in that red wax. As far as Gouda, though, I’m partial to the smoked variety. Thanks for stopping by! Martha… For the record, that really is a true story… and my wife helped me to eat all of that cheese (8 ounces) in two days time. Sometimes truth is stranger than fiction. Go UCONN Huskies! 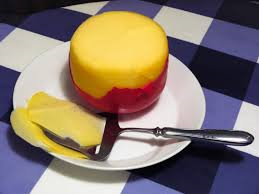 Didn’t know anything about Edam until now, so thank you for that. It’s definitely one of the things I like the most about the A-Z Challenge …. learning. Great post, Martha. How have I not met you yet?!? Cheese is my life, woman! Serious high five, one cheese lover to another. Fellow blogger doing the A to Z Challenge and visiting for the first time. What an interesting idea for a theme. I love cheese and Edam especially. I’ll come back to see what else you have to add on the different types of cheeses. I’m enjoying your posts, I LOVE cheese of all kinds! But I am so curious, is there really a cheese for very letter of the alphabet? And if so, how in the world did you figure that out? I can’t stop wondering, so I had to ask! Looking forward to every single one of them! Whew! I was stressing over that for you-lol! (Wondering things like are you going to do V is for Velveeta?!?) Glad to know you got it covered. I should do this next year, it sounds like fun! I blog for several companies and I don’t make time for my own. It would be a good challenge. You’re the third person who’s asked about Velveeta! Funny, Kim. Nope, I definitely have something else planned for V! I’ve heard of Edam cheese. Waiting to see your other posts.